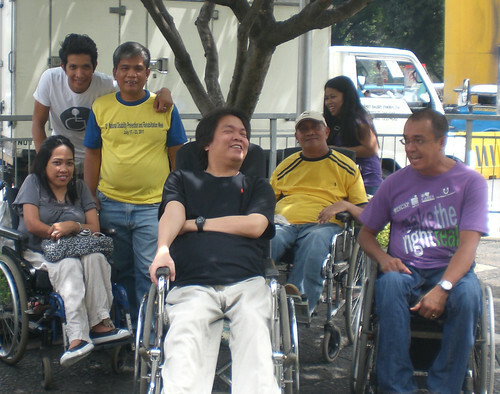 The ASP was among the groups who braved the EDSA-Ortigas interchange to support the PWD sector in clamoring for accessible transportation towards a truly inclusive society last 23 July 2012. Our very own Executive Director Ranil Sorongon gathered with a group of differently-abled individuals to formally submit a position letter to the Department of Transportation and Communication (DOTC) urging the secretary to address the issues of accessibility to transportation of PWDs. Assistant Secretary Ildefonso Patdu, Jr. warmly welcomed the group headed by Mr. Abner Manlapaz to his office for a dialogue. The group recognized and expressed their gratitude for the initiatives of DOTC and brought up the following issues requiring the government's immediate attention. 1. Elevators of Metro Rail and Light Rail Transits are not functioning. PWDs on wheel chairs need to be carried by the security guards and maintenance personnel which is embarrassing and dangerous. 2. Passenger vessels do not have accessible facilities. 3. Personnel in the transport sectors are not equipped with proper knowledge and skills on how to respond to the needs of PWDs -- either physical or otherwise. 4. No accessible public buses to provide transportation to persons using wheel chairs. ASec Patdu recognized the need to level up the responses of his department from providing logistical support to policies and projects that will really impact the lives of PWDs. The meeting will be followed up the a multi-sectoral planning session in August to discuss concrete steps to address the issues and concerns. The NPDR Week celebration coincided with the birth of our hero Apolinario Mabini, the sublime paralytic, the brain of the Philippine Revolution, and the epitome of what the Filipino PWD should aspire to be. He was a man who proved that disability is not a hindrance to serve the motherland.